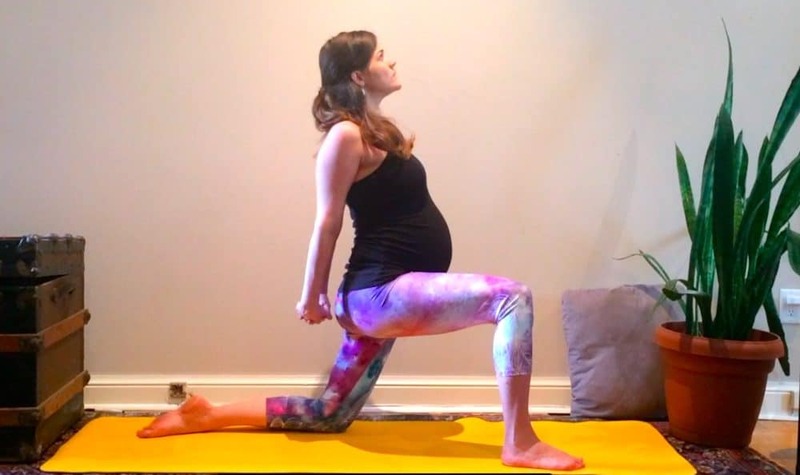 I am thrilled to share this article about Yoga Prescriptions For Common Pregnancy Ailments written by one of my favourite yoga teachers Ashley Holly. I have always loved taking Ashley’s yin yoga classes and, when we both became pregnant, it took our relationship to the next level. It was incredible to get prenatal yoga advice from someone who is not only an expert in the field but who was also going through everything I was. I was so grateful for Ashley’s classes and support during my pregnancy. 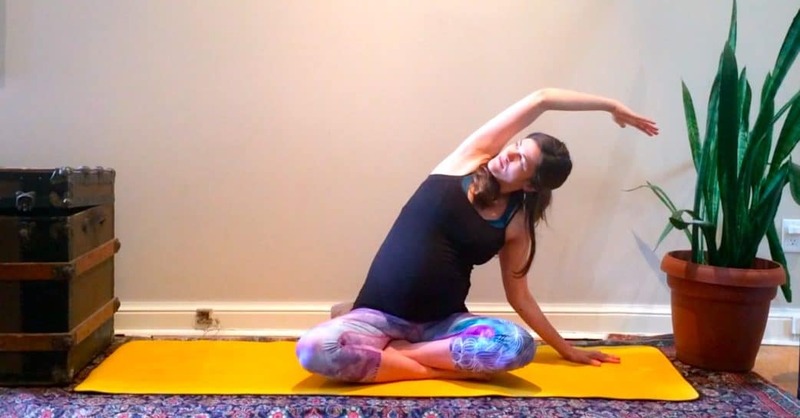 In her article Yoga Prescriptions For Common Pregnancy Ailments, she shares yoga poses for heartburn, back pain, leg cramps, the emotional roller coaster of pregnancy, fear, shortness of breath, insomnia, and imbalance. 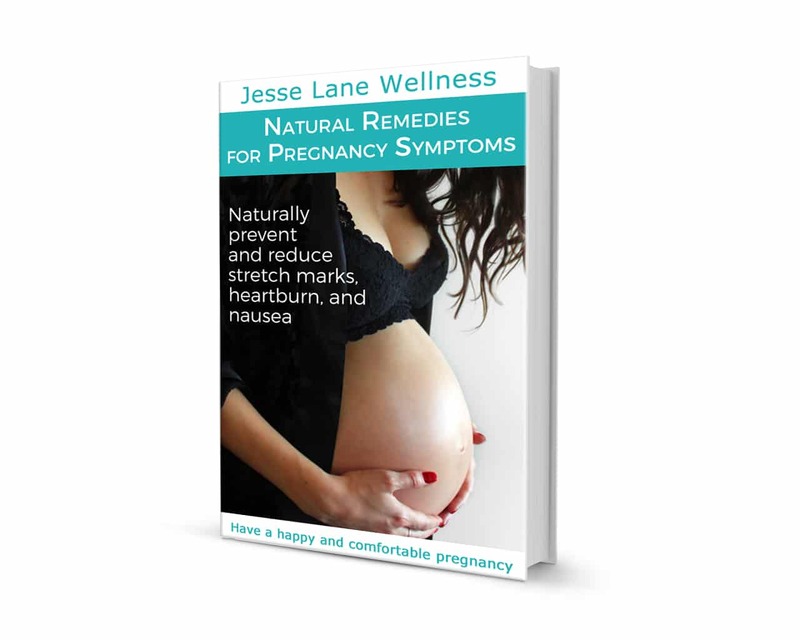 Check out my free eBook Natural Remedies for Pregnancy Symptoms if you would like some solutions that will complement your yoga practice. Pregnancy is beautiful. But… it is also exhausting, annoying, overwhelming and sometimes outright strange. I spent most of my pregnancy anchored to Google searching everything from “12 weeks pregnancy exhaustion” to “30 weeks pregnant leg cramping solutions?” to “36 weeks pregnant and frustrated at everyone, is this normal?” The message boards that Google presented me with were fully loaded with hundreds of comments by women in similar situations, and while the late nights scouring these message boards reminded me that I was not alone and that the many experiences we have during pregnancy are par for the course, they rarely provided me with powerful solutions. Eventually, I had to drag myself offline and get inline with my own answers. When we create space and are open to trusting ourselves, there is a powerful source of intuition that accompanies pregnancy, and more often than not, that intuition takes us exactly where we need to go – inside, into deep breathing, deep rest and dynamic movement. Based on both my own pregnancy experience over the past nine months, as well as meeting with exceptional women who work as midwives, doulas, chiropractors, yoga teachers, and pelvic floor specialists, I have compiled my tried and true list of yoga prescriptions for common pregnancy ailments. How To: Heartbed is my favourite restorative yoga posture. Start by setting up pillows or bolsters (1-2) vertical along the length of your spine. Lower your back down towards the props, allowing your arms to open to either side. Enjoy the expansion through your chest and heart centre. Either extend your legs or take the soles of your feet together, with or without props beneath your thighs. Remain here for 5-10 minutes and enjoy. Safe back bending can be a reliable source of healing back pain throughout your pregnancy. Remember to reduce the intensity of your backbends and to back off if it ever feels intense. I found the leg strengthening aspect of a modified crescent lunge, met with the gentle backbend it encourages, was essential in easing my lower back pain as well as neck and shoulder pain. How To: Start on all fours, supporting your knees with cushions if necessary. Carefully step your right foot forward to the outside of your right hand, setting your knee above your right heel. Use your hands for stability as you lift your torso away from the earth and bring both hands to your hips. Once balanced, engage your legs, hugging towards your midline and clasp your palms behind your back. Take a big breath in as you press your hands down and apart (without actually letting them separate). Keep your tailbone drawing down, your legs strong, and your breath steady. Hold for 3-5 five breaths. Repeat on the other side. I will never forget that moment at 23 weeks pregnant when I woke myself and my husband with a piercing yelp in response to my first of what ended up being many pregnancy induced leg cramps. My entire right leg was totally frozen in a tight spasm and I was terrified. Luckily, yoga provided me with some seriously effective solutions to these cramps. While legs up the wall, ardha hanumanasana and paschimottanasana do the trick, my favourite is this unnamed yoga move taught to me by my own pre-natal instructor Nicky Poole. How To: Start on all fours with your legs a comfortable distance apart and hands rooted into the earth. Extend your right leg back, spread your toes, firm your leg muscles and press your heel towards the wall behind you. Take three breaths here, feeling the stretch through the back of your calf. From here, rock your weight slowly forward and back 1-3 times before returning to all fours and switching to the opposite side. Is your mind constantly racing? Are you caught in a web of worries, anxiety, or stress? Pregnancy related or otherwise, the emotional rollercoaster that accompanies pregnancy is very real and very intense. Meditation is one tool that we can draw on literally any time, from any place. It is the most powerful prescription for overcoming whatever thoughts are flooding your mind. How To: Find a quiet place to sit cross legged, extend your spine, and rest your palms on your thighs or on your belly. Soften your gaze or close your eyes completely. Rather than forcing or controlling your breath, simply notice the rise and the falls of your inhalations and exhalations. Allow thoughts to breeze through your mind, like clouds moving through a big blue sky, continually reconnecting to your focus on your breath. Notice the rhythm, the sensation, even the texture of your breath. Just a few moments or an entire hour here will welcome a sense of calm and peace into your mind’s eye. While pregnancy should be celebrated, the truth is that the process typically brings up incredible amounts of fear and anxiety. The “What If’s” and voices in our head can become insurmountable. 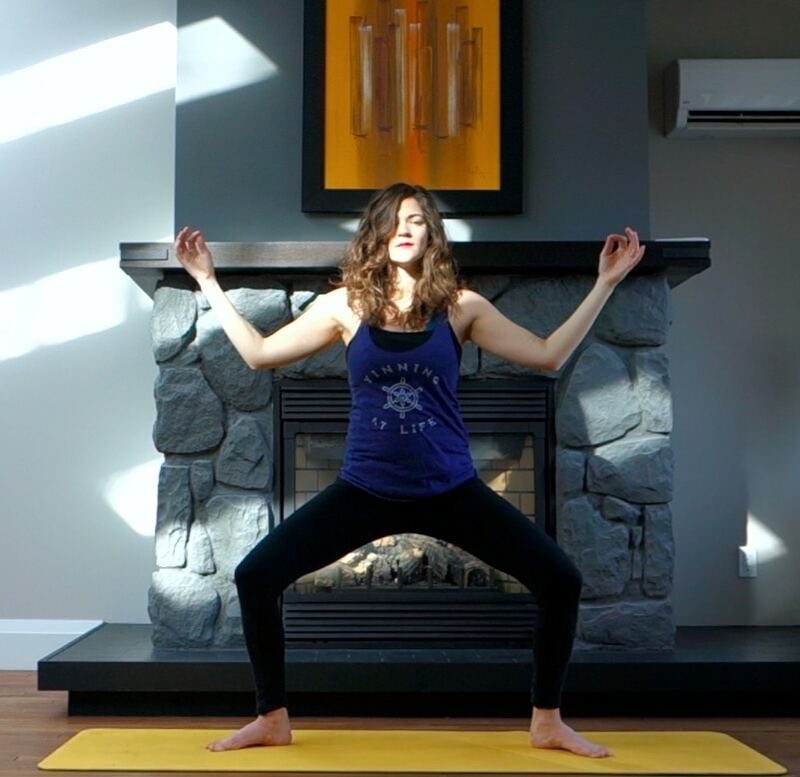 In my own experience, it was strong, fierce, and confidence building flow yoga sequences that really reminded me that I was powerful, courageous, and capable of childbirth and motherhood. Goddess Pose and Goddess squats were my all time favourite posture to reclaim my courage and ditch my fear. How To: From standing, separate your feet just beyond hip distance apart, angling your feet approximately 45 degrees, while ensuring that your knees are tracking over your second toes. Bend into your knees while keeping your tailbone downward facing. Bend at your elbows with open palms or taking a mudra. Take 5-10 long, deep, powerful breaths here and if you are feeling courageous, make loud sounds on each exhale, either fluttering your lips, growling or making a strong “ahhh” sound. These sounds will do wonders during actual labour and you can practice eliminating the sound shyness now. As your baby grows, your body has less and less space for those big deep breaths that we yogi’s have come to know and love. A seated side stretch can help create more space in your side body to enable soothing, long, and opening breaths. How To: Start in a comfortable seated position with your legs crossed. Feel free to add a cushion underneath of your hips. Rest your left arm gently on the ground while you lift and extend your right arm up and to the left. Breathe deeply into your right side body, gazing up or down. Hold for 3-5 breaths. Repeat on the opposite side. There were many late nights during my own pregnancy where I was restlessly awake in bed. During this time, I would turn to mantra repetition and midnight breath work to help quiet my mind and my body. Sometimes sitting upright in a traditional meditation seat, other times lying gently on my side. How To: While you are lying in bed navigating the many discomforts of pregnancy and the wanderings of your mind, take a long deep breath in through your nose and out through your mouth. As you breathe in, silently repeat a mantra such as “As I breathe in, I know I am breathing in” and while you breathe out, silently repeat “As I breathe out, I know I am breathing out”. Continue repeating this mantra (or any other mantra that resonates with you) for as long as possible. At 20 weeks pregnant, I actually fell while getting onto the streetcar. My belly had just popped, and I could not figure out how to stand on my own two feet and carry the new weight in my body. Regain your sense of balance with this stabilizing and strengthening posture. How To: From all fours, find stability first through your hands and feet. Extend your right leg ensuring that all toes are pointing towards the earth. Extend your left arm turning your palm to face the centre. As you breathe in, reach your heel and your fingers in opposing directions, as you breathe out, draw your right leg and your left arm towards your body centre (depending on your stage in pregnancy you may not move very far, remember to always honour where you are). Extend and compress 3 times on each side. During your pregnancy, it is important to listen to your body, to slow down and to tune in. Allow this to be a time to curiously discover and uncover postures that best suit your own needs. Give yourself permission to abandon your yoga practice altogether if it is simply not working for you. 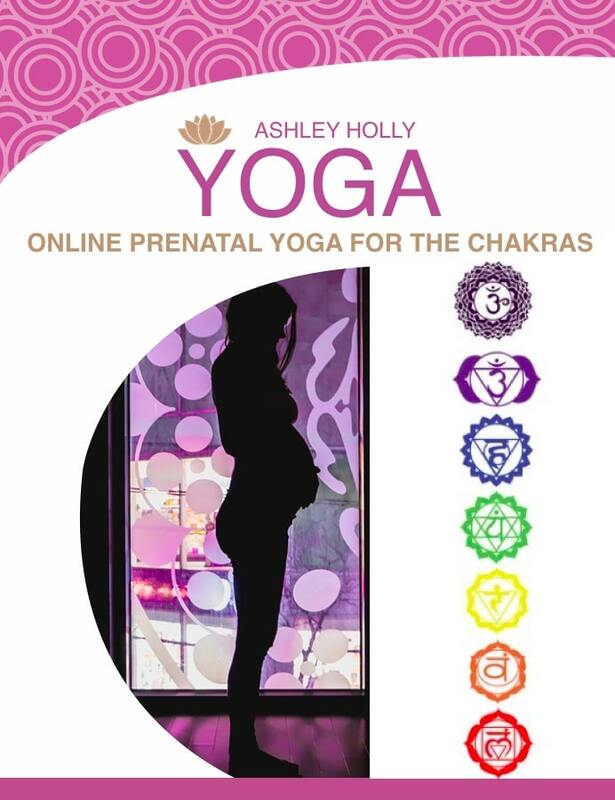 If you are interested in trying these out yourself, check out my Online Prenatal Yoga Program for your Chakras. Every week, for seven weeks, you will receive an email outlining the do’s and don’ts of prenatal yoga, a journaling exercise, and insights about the chakra we are opening that session. Each email is accompanied by access to an online prenatal yoga video. The videos are ordered in terms of first, second and third trimesters. You can practice the videos as they arrive in your inbox, or at any time throughout your pregnancy. Register Here or email Ashley at yogayudaflow@gmail.com if you have any questions. If you are looking to have a happy and healthy pregnancy, you will love my book Healthy Holistic Pregnancy. It provides you with information on the best foods to eat and supplements to take to support your baby. It also explains in detail which supplements and superfoods you may want to avoid due to safety concerns. Pregnancy can also come with many discomforts and symptoms; the good news is there is something you can do about it! 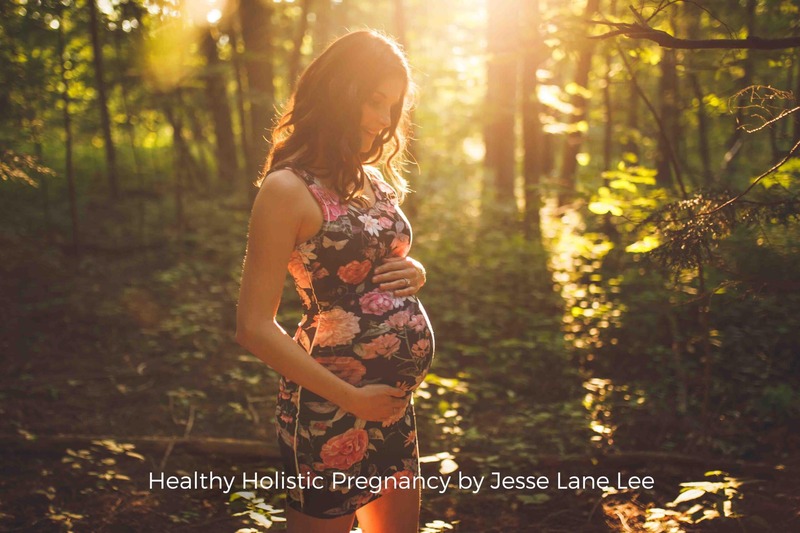 Healthy Holistic Pregnancy provides natural solutions for over 25 common pregnancy symptoms including morning sickness, stretch marks, fatigue, and back pain. Buy my book Healthy Holistic Pregnancy. Today’s post on Yoga Prescriptions For Common Pregnancy Ailments is a guest post by Ashley Holly. If you are interested in publishing an article on JesseLaneWellness.com, please email info@jesselanewellness.com.